YouTube is the most popular video sharing website where millions of users daily share and enjoy videos. We all use YouTube for watching videos. But sometimes searching for a video takes too much time. YouTube also has search filters to narrow your search. You can also use those filters by using Search operators. In this article, I am adding for YouTube search operators for better video searching experience on YouTube. With these search operators, you will be able to find the desired video content quickly. You will be able to narrow your search criteria to find what you are looking for. If you are only searching for the channel, then just entering the channel name will show you many videos having that word in video title and description. But you can just get channels results by adding word “, channel” in search query. If you are searching only for playlist. Then append ‘, Playlist’ word in the search term. And results will contain only playlists. This is very helpful. If you are searching for video, then this search operator will help you in searching only “HD” videos. Just add word ‘, HD’ in search query. It will show you results only with HD video. Many times you need videos with in-depth tutorials or interview. So, searching for long videos will give you results with full episode. Because many people upload small clips of a large episode in parts. So, limit YouTube search to return long video. In case you want short video, just use this search operator and it will give you videos shorter than 4 minutes. If you want to search videos uploaded within a time range, you can try this search operator. 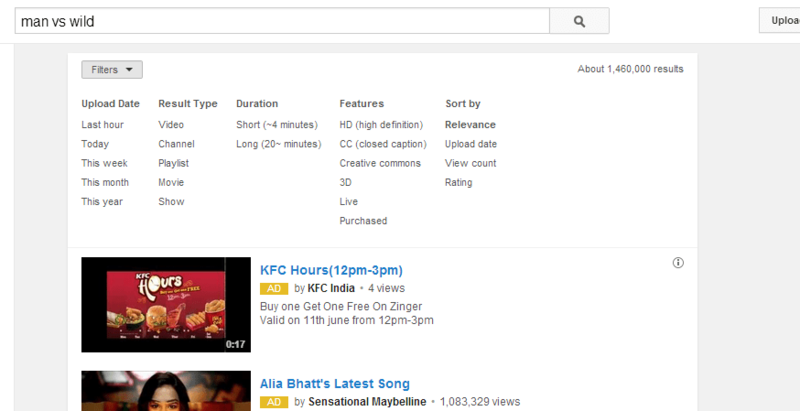 if you want to search videos uploaded within last hour add ‘, hour’ in search. For Video uploaded today, add ‘, Today’ in search. Similarly add ‘, week’, ‘, month’ and ‘, year’ for refining your search. Like Google, YouTube also allows you filtering the search by finding results with exact words. If you want videos with a specific word in title, use intitle search operator. But use of this search operator is different from the operators I mentioned above. This will search videos of Moto E with at least “Unboxing” word in title. If you want to search for multiple words in title, use allintitle. If you want to show videos of some conference of live event, just add ‘, live’ in search and it willdisplay the live streaming videos. If you want to watch full movie on YouTube, just add ‘, movie’ and it will display the results with Movie only. You can also use zerodollarmovies to watch full length movies of YouTube. Similarly, you can also search for 3D movies by adding ‘, 3D’ in search query. But you need to have device capable of showing 3D content properly. Or buy 3D glasses to watch these videos. If you think that it is hard for you to remember all these search operators, you can try YouTube filters. When you add these search operators, it automatically adds a YouTube filter. To manually apply a filter see the filter dropdown below the search box. Now you know few good YouTube search operators. These search filters will help you in finding videos quicker. Try these YouTube search filters and share your experience with us via comments. YouTube is now a part of our daily life. If you know search operators, you can easily filter results and get the best out of it. If you find this article useful, do not forget to share it with your friends.